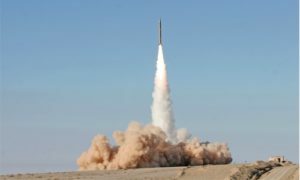 Iran no longer needs to explain the reasons for the tripling of its total missile production, a senior Islamic Revolutionary Guard Corps (IRGC) commander said. Iran has test-fired ballistic missiles several times in recent months. “Our production has increased three-fold compared to the past,” Brig. Gen. Amir Ali Hajizadeh, head of the IRGC’s aerospace division said, according to Fars. Meanwhile, French Foreign Minister Jean-Yves Le Drian visited Iran on March 5 in what was said to be a mission to reaffirm Europe’s support for the nuclear accord. Le Drian said there was “still a lot of work to do” on Iran’s missile program after meeting with top officials, including President Hassan Rouhani and Foreign Minister Mohammad Javad Zarif. Zarif countered that Europe needed to “play a more constructive role to preserve” the nuclear deal. “And above all to put pressure on the United States to meet its commitments under the deal and not to allow it to present illogical and illegal demands,” Zarif said. President Donald Trump has threatened to pull the U.S. out of the deal unless three European signatories help fix it by forcing Iran to limit its influence in the Middle East and rein in its missile program. Rouhani last month rejected any negotiation over Iran’s missile program. Iran has test-fired ballistic missiles several times in recent months. The United States and other Western countries say the tests are a violation of the UN resolution enshrining the 2015 nuclear deal.